ENGEO was named the second fastest growing business in the South Island in 2014 and 19th nationally, for the Deloitte Fast 50 2014 awards. The Fast 50 is a list of the 50 fastest growing businesses in New Zealand over the past three years. 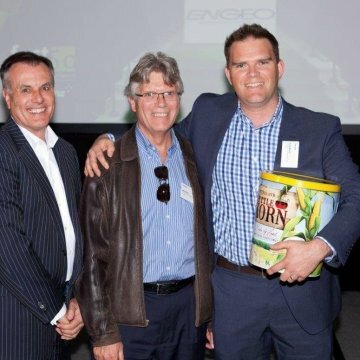 The Canterbury ceremony was attended by ENGEO’s Don Bruggers and Greg Martin on September 30, 2014, where they accepted an enormous can of kettle corn on behalf of everyone! While the corn is a satisfactory prize on it’s own, there will be a second ceremony held in Auckland in early November where the national rankings will be announced. The awards ranks and recognises New Zealand’s fast growing companies. “Making the Deloitte Fast 50 is a big deal for us as it is widely celebrated. Thank you to everyone who has helped grow ENGEO’s New Zealand presence into the great operation it is today. This reward is recognition of all the hard work and selfless contributions you have made,” said Greg Martin, PEngGeol.